NYC Educator: Is There Any Point to UFT Class Size Regs? Is that a silly question? I don't know anymore. Maybe it's because I haven't had that many relatively serious issues. I mean. I go to the arbitration hearings with a few dozen oversized classes. I regularly see colleagues with two or three hundred. It's understandable that things are a mess the first few weeks, but usually with time we can iron things out. The thing is, that doesn't always happen. I know this because I regularly have to return in February. Sometimes this is because we have College Now classes that are oversized. The DOE will argue that these classes are funded by outside sources so they aren't covered. Hey, thanks a lot, colleges, for funding classes that exceed 34. You're doing a great service for our high school students. Sometimes oversized classes are taught by supervisors. Because they aren't UFT, they aren't covered by the contract. It's ironic that the people who are supposed to model best practices don't give a golly gosh darn how many kids they shove into classrooms. I guess that's why they get paid the big bucks. Now when you go in February, you have to wait a while for the ruling. This year, the ruling came out on March 28th, but I didn't see it until April 4th. This means that over 40% of the semester had gone by for my school and others with absolutely nothing done about the issue. I'm not precisely sure how well that represents the "Children First, Always" mantra of the NYC Department of Education. One of the ironic things about that motto is that it's actually me advocating for better conditions, while the DOE fights to violate rules that already leave our kids with the highest class sizes in the state. It's May now, and 60% of the semester is over. The DOE lawyer told my principal that he didn't need to follow the order for the class size reduction. Rather, he said, he should follow the ruling of the last administrator that said relieve teachers of one day's C6 assignment. You know, one less day of teacher tutoring. That's how we put "Children First, Always" in New York City. I'm still waiting on the mysterious "compliance call" mentioned nowhere in the UFT Contract. Who would've thunk that once you win in arbitration, all it means is one more delaying tactic? Let's imagine a best-case scenario here. Let's say that this call takes place some time today. Let's say the arbitrator sticks to his guns and says cut the crap and follow the rule you agreed upon. Let's take the even more unlikely step of imagining that my school and the others affected by this order, Flushing, Forest Hills, and Hillcrest, all comply with this order later today. What that will mean is that, for the classes that are fixed, that 40% of the semester will comply with clear regs. Actually, though, that's not necessarily true. A few weeks in June are dominated by Regents exams, and the last two days are a ridiculous appendage added by Walcott even though grades are already in and finalized. So it will be less than 40%. In fact, in cases where classes are annualized, the classes have spent 80% of the year oversized, so they will be less than 20% in compliance. DOE argues that in semi-annualized schools we ought not to be able to grieve twice a year, reorganization notwithstanding. The way they put "Children First, Always," is to hope for the best in a Fall ruling and then say, "Screw you for the rest of the year. Sit in your crowded classrooms and leave us the hell alone." I was able to work out a long-term solution for my school, with the help of UFT's Ellie Engler. In three or four years we should have an annex, and we ought to be able to accommodate the kids who now sit in our crumbling trailers and windowless closets. A simpler solution would have been to accommodate the number of students our building actually supports, but that wasn't in the cards. More importantly, my school is just one. What about the others? Who knows? It's great that we have these regs written into the contract. It's not quite as great that we haven't managed to modify them in 50 years. With all the exceptions and red tape built into them, they clearly don't work as intended. It's amazing the "Children First, Always" city regularly pays lawyers to find ways to violate the rather lax class size limits it negotiated half a century ago. Even more amazing is that we need to hold hearings in order to manage such simple regs. 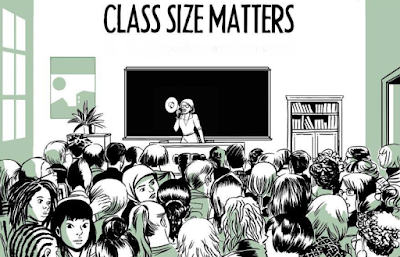 If class sizes are 34, why the hell don't we just keep classes at 34? Why does even UFT leadership fight efforts to do that? Our class size regulations allow us to have the highest class sizes in NY State. Our weakly worded Contract leaks like a sieve and allows the city to violate them with impunity almost at will. And that's not even considering the CFE lawsuit, which said we'd make things better rather than worse. If the city wants to put "Children First" ever, it has to do better. And UFT leadership can do better as well. I renew my call that they work with us and other class size advocates. I renew my call that we become the advocates for children we signed up to be when we took this job in the first place.